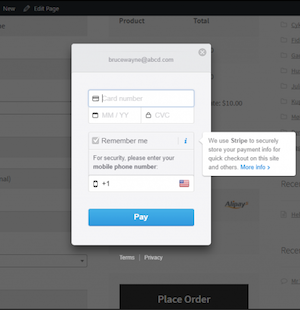 Our WooCommerce Stripe Payment Gateway Plugin lets you accept Credit Cards, Debit Cards, Alipay and Apple Pay payments directly on your website via Stripe payment gateway. This means a smoother experience for your users as they never have to leave your website for making payments. 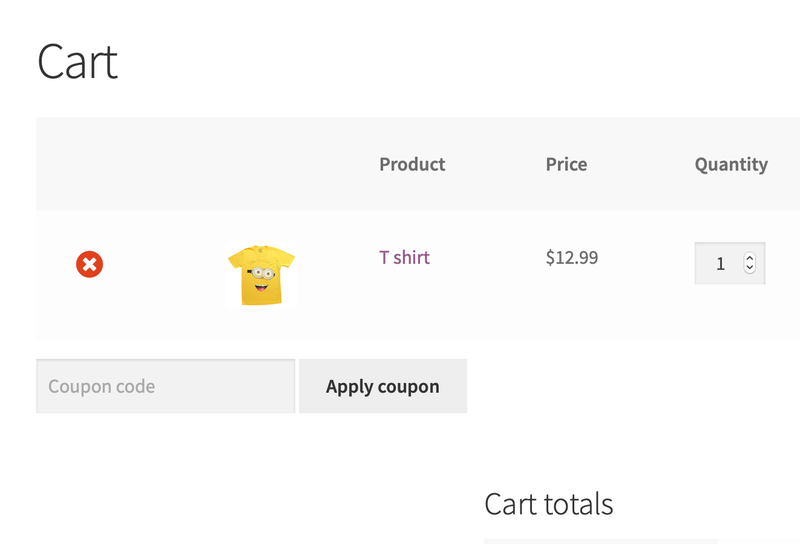 This WooCommerce extension for Stripe allows your customers to make payments directly on your store via Stripe’s API. Stripe is available in countries like United States, Canada, the UK, Australia, Belgium, France, Germany, Ireland, Netherlands, etc. Check out the Complete list of supported countries by Stripe. Stripe Overview Page: A consolidated overview of Stripe Payments, where you can do one click capture and refund. Full and Partial Refunds: You can perform refunds from individual order admin page as well as Stripe Overview page. Currency Conversion: Once currency conversion option is enabled, Customers will be provided an option to convert the total amount to their preferred currency while checkout. Email Receipt: Once enabled, transaction receipt of a successful transaction will be sent to your customer by Stripe. Shipping Flat Rates for Apple Pay: You will be able to enable shipping flat rates with Apple Pay. This flat rate will be charged to customer while checking out using Apple Pay. Customization Options: Customize the logo, payment method name, description, button text and more. Restrict Cards: Choose the card types which you want to accept on your store. Restrict payments only from preferred card types. 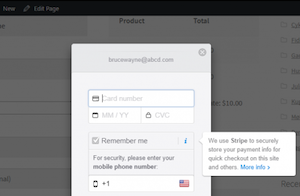 Save Cards: Save customer’s card details to your Stripe account, so that customers can use it later. Display Product Details on Stripe Dashboard: Along with order number, product name is also displayed on the Stripe overview page/dashboard. Meta value of product details will be sent to Stripe for this. Apple Pay is simple to use and works with the devices you use every day. Easily pay with your debit cards and credit cards with just a touch. And because your card details are never shared by Apple when you use Apple Pay, making payments with your iPhone, Apple Watch, iPad, and Mac is the safer, more private way to pay. Directly accept Credit & Debit Card payments. With Stripe, you can accept MasterCard, Visa, American Express, Discover, JCB, and Diners Club cards directly on your store. In addition, Stripe supports Apple Pay and Alipay. Our plugin supports AliPay integration via Stripe. AliPay is China’s leading third-party online payment solution, providing an easy, safe and secure way for millions of individuals and businesses to make and receive payments on the Internet..
Apple Pay is integrated on Cart and Checkout Page. Check out compatible devices. Do one click Payment Actions and review payments by dedicated Stripe Transaction Overview Page. WPML Supported. French and German ( Deutschland ) language supported out of the box. Supports WooCommerce Subscriptions by WooCommerce. Great support and timely updates! Ready to try the plugin? Visit the admin settings for Stripe Payment to change the Generic settings, entering stripe credentials, defining stripe actions, enabling Apple pay, enabling Alipay and more. A consolidated overview of Stripe Payments, where you can do one click capture and refund. 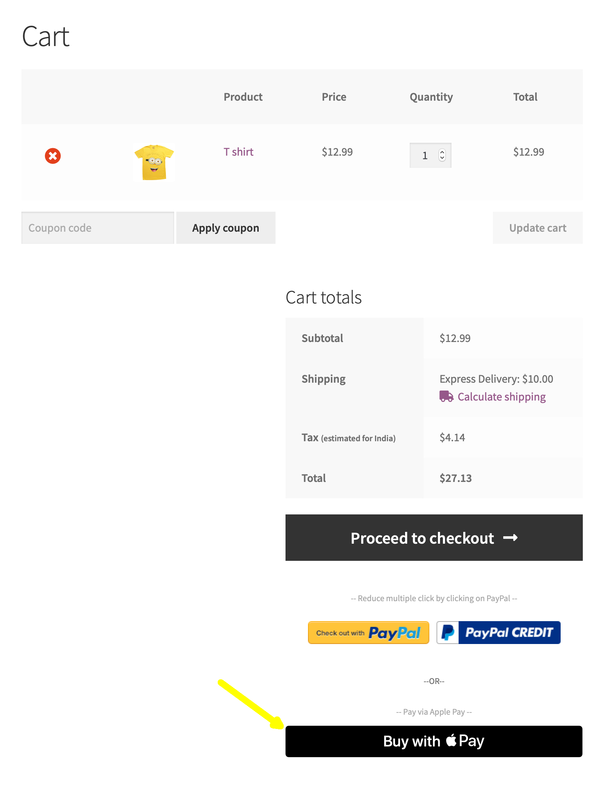 You can also have the Apple Pay button on the cart page. Mark was so helpful and fast with support. Excellent service, support and plugins. Thank you for your big help again Mark!! Works well. Easy to setup. Good customer support. I had an issue setting up the plugin, but Mark in their support team was on hand to kindly guide me through what I had to do. It’s my first time using Stripe let alone this plugin, but I must admit I’m impressed. I tried another few plugins before this one but I’m glad I decided to go with this one. I’ll definately be using it again. There was an issue at the beginning as the gateway not supporting the latest woocommerce well. However, Mark has offered me a solution in two days so I have nothing to complain. Happy customer I am so 5 stars give to Mark and his work. It is not easy to have a plugin that can work with the Alipay via Stripe. There are some issues on that part due to some changes in the Alipay side (or Alipay with Stripe side) at first, Luckily Xadapter support fix that finally. I suggest Xadapter to show a demo site or just a video for potential customers to know how it works with stripe. As a first timer on stripe, it is not easy to understand every step for the payment not until I done everything. Excellent experience so far. We had real problems with another Stripe plugin provided by Woocommerce. It seems like lots of people were having the same problem with it but no-one could or would provide a solution. 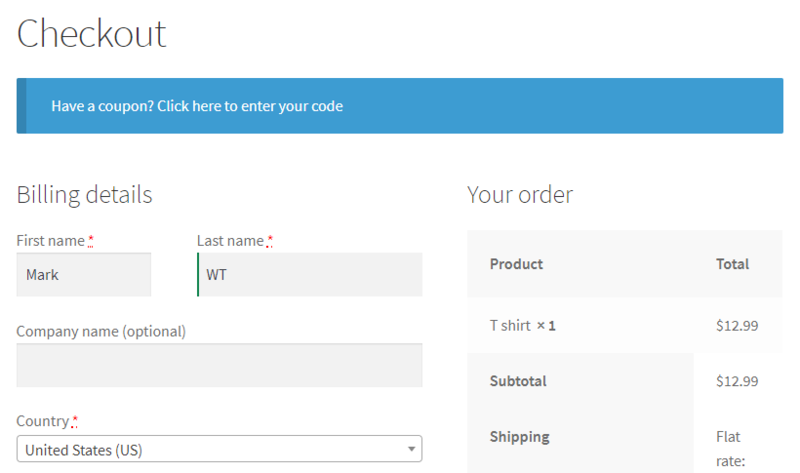 Faced with having to pay steep WooCommerce consultant fees, I discovered the Xdapter Stripe WordPress plugin. The plugin was super easy to setup and worked first time (after I corrected a mistake I made with the input of the APIs)! Support from Xdapter has been amazingly swift. I gave 5 starts because the way Mark has been helping out and updating the plugin when I find things that are not working or not displaying properly. Quick turnaround with support! The plugin needs a little bit of tweaking still, but it is very very close to being exactly what I needed to implement Apple Pay. Will update review as I use the plugin. Cuz the support is awesome! Had a slight issue with Apple Pay upon installing, they had it fixed within minutes. Very happy. Had issues with setup which turned out to be my fault, support identified and fixed issue within 24 hours of my support request. Given I emailed on a Sunday from Australia, I was happy with the response time. Apart from that the app so far, has been easy to setup. Fixed error of stripe and Alipay not working when Apple Pay is activated. Fixed : After capture in Stripe Overview page, refund not showing. Fixed : In transaction details, after refund, not showing fully refunded. Alipay Support with Chinese Yuan. Alipay Support with the latest version. 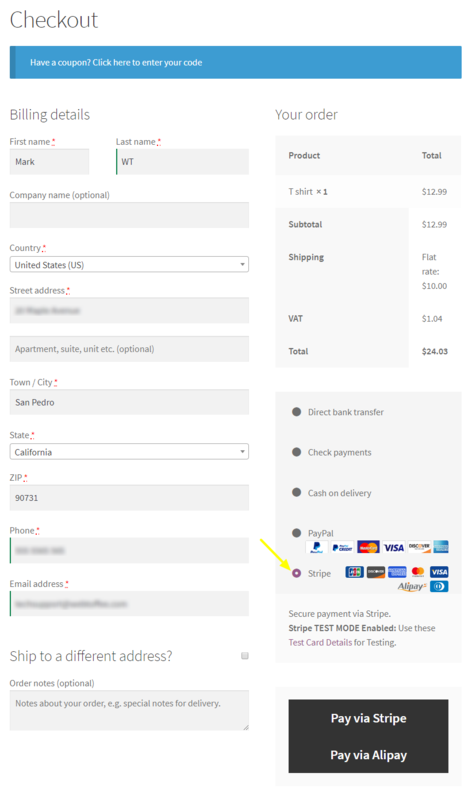 Stripe Product Details Request Separated. Product Details will be sent to Stripe as Meta. Apple Pay with dynamic Rates and Shipping. Tax total added with Apple Pay payment. Apple Pay Button auto screen width. Stripe Timestamp issue and log for WC2.7 fixed. 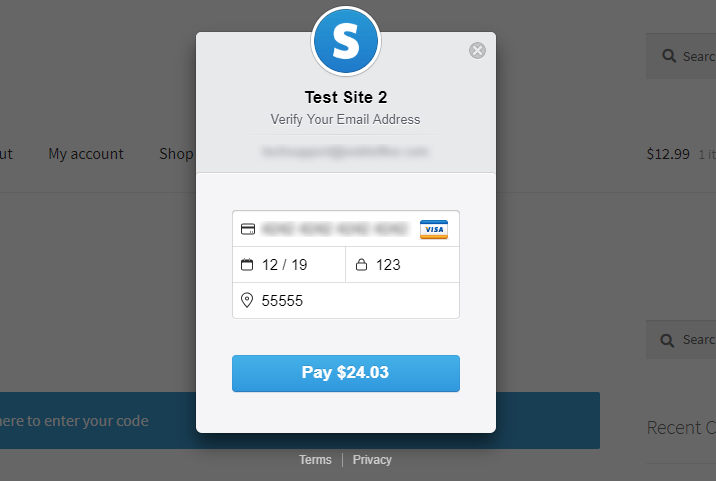 Stripe Compatible with WooCommerce Version 2.7. Bug Fix for Apple Pay could not processed. Bug Fix in Restrict card option for not restricting preferred cards. WPML Support: German and French languages support. Supports all credit cards types.